Oklahoma U.S. 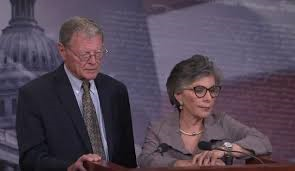 Senators Jim Inhofe and Barbara Boxer on Tuesday released their various of The Water Resources Development Act of 2016. Inhofe is chairman of the Senate Environment and Public Works committee and Boxer, a Democrat from California is the ranking minority member. Their Act authorizes 25 critical Army Corps projects in 17 states. “These projects, which had undergone Congressional scrutiny and have completed reports of the Chief of Engineers, will strengthen our nation’s infrastructure to protect lives and property, restore vital ecosystems to preserve our natural heritage and maintain navigation routes for commerce and the movement of goods to keep us competitive in the global marketplace,” said the two Senators in releasing the plan. “This year, our bill prioritizes projects that will deepen ports to increase our global competitive advantage and will provide protection from disastrous flood waters,” added Inhofe and Boxer. Flood control and coastal hurricane protection projects are included. Levees will be rebuilt in Kansas, Missouri, North Carolina and Texas and hurricane protection will be boosted in Louisiana. The bill also authorizes the Federal Emergency Management Agency to provide assistance to rehabilitate high hazard potential dams. Inhofe and Boxer also said the bill streamlines the process of modifications to existing Corps projects and for new water withdrawals from Corps reservoirs. The bill also expands the role of local partners in the implementation of water resource projects.